Swiss watch brand Swatch showcases, in a new commercial, the limited edition of Flying Pig by Ms. Pigcasso watches, which includes pieces featuring artwork by Pigcasso, the world’s only painting pig. 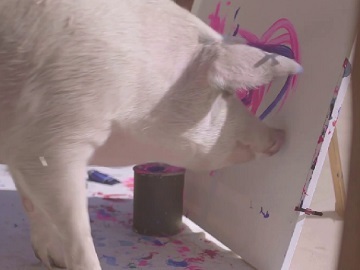 The spot features the fine swine, who was rescued from the brink of extinction at a South African pig “farm” and has been working with child-friendly, non-toxic paint to create works of art since 2016 (the year she was rescued), as she stands up and makes a drawing on a canvas, which is then used to create the colorful design of the Flying Pig watch, which features shades of pink and purple on the white dial, green and blue on the white strap (made from silicone) and a round transparent case (made from plastic). The Flying Pig by Ms. Pigcasso watch, produced in 2019 pieces to mark the Chinese year of the pig, is available for purchase for $125. All proceeds from the sale of these limited editions will go to the Farm Sanctuary. Each watch comes with a duplicate of one of Pigcasso’s artworks and the certificate of authenticity.